Today Chad and I drove across the wide open spaces of our part of Texas, sometimes chatting amiably, sometimes watching the scenery go by in silence. He spent time listening to speculation about his beloved Dallas Cowboys on sports radio while I dozed in the passenger seat. And at one point we spent a few minutes thinking and talking about our life and the interesting turns it has taken through the years. We never knew that we would wind up here, twenty years into our marriage, happily answering God’s call in our little town. Yet, here we are. God has been so gracious to bring us here where life is simple. The commute to anywhere in our town is four minutes. Trips to our local grocery store are bound to take awhile because there will be friends inside to talk to. Our world doesn’t revolve around money or cars, fashion or fancy houses. Our life here is beautiful and small and unique. There is a certain simplicity to it. Yet, through the years we have learned just how complicated a pastor’s calling really is. As people, Chad and I are irrevocably intertwined with others. We are likely to hear deep, dark secrets which we hold close, not even allowed to share many things with each other. We are entrusted with some of people’s most delicate admissions and live through some of their darkest hours with them. Our life is simple in so many ways. Yet, our life is about people, and people are anything but simple. We are complicated creatures filled with all kinds of surprising and delightful and shocking and sad secrets. Every room is at the same time a crowded collection of interpersonal struggles and warm friendships, family strife and sin struggles and amazing examples of God’s grace and mercy. As a pastor’s family, we get a front row seat to all of it. I have seen Chad carry the heavy burden of failing marriages and sudden deaths, of children with no heat in the dead of winter. I have seen him try to be the ultimate problem solver while problem after problem is laid before him. I have heard his prayers for the many people on his heart and mind at midnight when he should be sleeping. And while all of this is going on, still he wrestles with his own spiritual battles. Still he studies and tries to flee temptation and undertakes the difficult task of dealing with difficult people, precious people, kind people, and mean people, all while begging the Holy Spirit to keep him from sin. To give him the mind and eyes of Christ. Still he feels the weight of his next sermon, always bearing down no matter what else is happening in his life or the lives of those who need him at any given time. These aren’t things that pastors can really talk about with the rest of us. They carry a unique load, and one that isn’t easily understood by those of us who don’t bear their responsibilities. It’s a complicated calling. Chad and I thank God every day for this simple, complicated life. We thank Him for the complicated people who have been entrusted to our care, and we thank Him for the simple message of the gospel, which can cut through the most complicated of circumstances. One thing we have learned in these pastoring years is that every complicated situation really comes down to just one thing: we all need Jesus. Watching Him work in the middle of even the most difficult and crazy circumstances proves it to us over and over again–Jesus is the real problem solver. A simple truth for a complicated calling. I was young, tender and impressionable in those days, when I would often leave church services with traces of tears on my cheeks, convicted and moved and wide-eyed in my pursuit of Christ. I remember one morning, sitting enthralled as the pastor read the story of Lot and his wife and daughters fleeing Sodom. He came to the moment when Lot’s wife made her fatal mistake: she looked back at the city as everyone she knew in it was reduced to ashes by fire falling from the sky. I imagined all of the things that Lot’s wife may have been thinking in that moment. Maybe she was looking back with fondness at the sinful city. Maybe she was heartbroken for the friends she had there–even her own sons-in-law stayed behind and were now facing the wrath of God. In her disobedience after God told her to go and never look back, maybe she was proving that she didn’t want to let go of her old life and her old self. Jesus Himself told us to remember Lot’s wife, so her looking back had to be significant. It had to matter. I knew it was an important lesson for all of us, and, pen poised, I waited to hear from the pastor what that great lesson was. Lot’s wife turned and looked back, he said with fanfare. I guess she left a full shopping cart behind. And that was it. That one-liner was the extent of his dealing with Lot’s wife. Not only had he glossed over the reasons that Jesus warned us not to be like her, he reduced her to a stereotype–just an uncomplicated figure that had deeper feelings for her shopping cart than for the flesh and blood people she was leaving behind. The spiritual significance of her disobedience was completely lost, and I, a potential leader of a young generation, was left with nothing more than a rather sexist caricature of an important woman in the Bible. That pastor wasn’t trying to miss an opportunity. But, he did. His focus was obviously elsewhere in the passage, and although he did seem to ignore the significance of Lot’s wife in his sermon, that’s not the reason that I remember what he said about her all these years later. I remember it because I knew what he said wasn’t true. He had reduced Lot’s wife to a cartoon or a cardboard cutout, and while he got a laugh, he missed the chance to reveal a deep truth to a young woman who was ripe to hear it. He probably felt like he needed some laughs worked into his sermon. He probably searched high and low for funny stories to use to fill in between scripture passages. He probably worried that people would lose interest if he taught deep truths in favor of one-liners. After all, for many years we set up our churches as a hubs of comfort and entertainment. We built churches that were filled with complacent members who didn’t expect or particularly want a challenge. I for one want our churches to be places where pastors can be funny when they choose to be and when it suits their personalities. But, more importantly, I pray that our churches will also be filled with people who are so hungry for God’s word that we want deep and difficult truth over caricatures. I pray that our churches will be environments where pastors can step into the pulpit and tell God’s absolute truth as presented in the scripture, where they can look into the faces of the up-and-coming leaders and give them the meat that they need in order to grow. This week we talk about the pastor’s conference, t-ball, women’s conferences, a lesson from a funeral, giant pencils, and more! This weekend was huge in our church. We re-dedicated our building to God’s service as our big remodeling project comes to a close. We called it A Celebration of God’s Faithfulness. Former pastors returned to be a part of the celebration, former members and friends and family came home to witness a new beginning, a continuing of the work that God started 116 years ago, and a fresh reminder of what our mission really is right here on our corner of our small town. Pastor Jimmy Draper, President Emeritus of Lifeway, even came to deliver our celebration message. And, he was wonderful. It was a great day for our church family. But, all afternoon I’ve been just sitting here marveling at how beautiful the church really is. I’m not even talking about the newly beautified building, although it looks amazing. I’m talking about the Body of Christ. The individuals who work together to carry out the mission of sharing the Gospel with a lost and dying world. The Body of Christ needs its Jimmy Drapers. And its other pastors, musicians, great leaders, great teachers. It needs the speakers, the singers, the planners and the idea people. But, this weekend I was struck like never before by how much the church needs other types, too. It needs the nursery workers. It needs the cooks. The quiet, smiling watchers who look for needs they can fulfill. It needs the table wipers. The nose wipers. The toilet cleaners. The church needs the people who will remember to bring the plants inside when it’s going to get cold overnight. It needs the list-makers. It needs the huggers and the handy men and the hand holders. 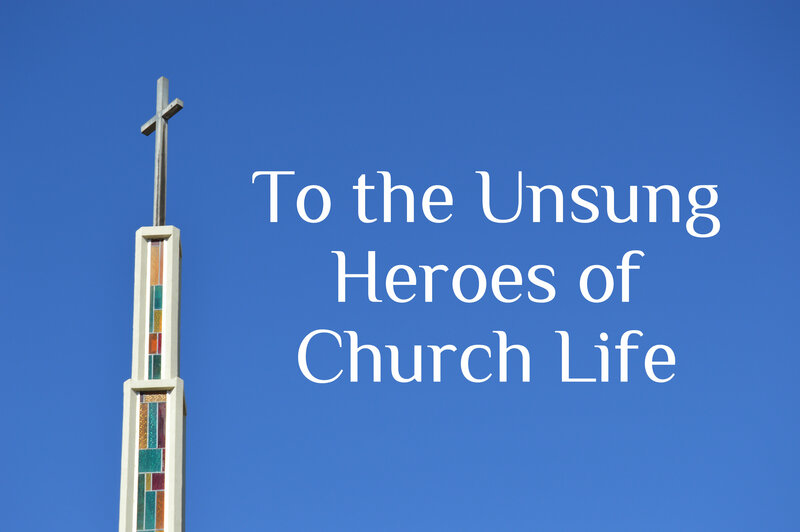 In fact, all of these people and countless others are essential to the church. They are the real heartbeat of it. They are what make things go, what make people feel special and welcomed, what make the children feel loved and safe and maybe just a little spoiled. These people, these ceaseless title-less workers, they are the very heart and soul of the church. As I looked around this weekend, I saw them everywhere. And, they blessed me. I’ve known many people in church life who feel invisible. Who work endlessly with little or no thanks. Who feel that they have no talent or ability to offer to the Lord. But, please let me assure you, there are days when it hits those around you just like a lightning bolt: you are doing some of the most important work of the church. Because only a few can preach. Only a handful can teach. And, really only some can play a beautiful piano piece or belt out a worship song on stage. But, you who are never on a stage, you who are always in the kitchen, on the floor loving on babies, you who are replacing lightbulbs and mowing the church lawn, you who are simply offering smiles and hugs and words of encouragement–you are doing kingdom work. You are the reason that a church can survive out on the plains of West Texas for 116 years. Pastors come and go, following God’s leadership. Musicians trade places and move on and move away, according to their calling. But, you. You servants who stay planted in the thankless jobs for a lifetime. You are the pillars on which a healthy church is built. And, God sees you. Thank you for all you do. Please know that pastors and their families rely on you more than you could ever realize. We recognize your love for God and His church. What you do matters, and we appreciate the sacrifices that you make in order to follow God’s direction in your life. Even if it seems like no one ever notices your quiet faithfulness, we do. And, we love you for it.